The Lamborghini Murciélago LP640 Roadster will receive its world première at the Los Angeles Auto Show tomorrow, less than a week ahead of its European debut, scheduled for the Bologna Motor Show next week. The Murciélago LP640 Roadster follows hard on the heels of the LP640 Coupé, which made its debut in Geneva earlier this year, a car that pushed the Murciélago theme forward and which has galvanised sales the dramatic V12-engined supercar. The new Murciélago Roadster model will receive the same tag as the revised coupé, LP640 (which refers to its engine position - longitudinale posteriore - and to its power 640bhp). 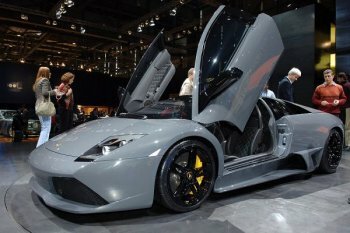 In creating the Murciélago LP640, Lamborghini's designers and engineers not only focused on reworking the engine, suspensions, gearbox, exhaust system, brakes and electronics, but also the interior and exterior design; improvements that have made the Murciélago LP 640 the most extreme and fastest sports car in its class. Now these important changes and improvements have been made to the Roadster version of the Murciélago, offering the advances of the LP640 coupé with added benefit of 'wind in the hair' motoring. Lamborghini have also chosen the Los Angeles Auto Show as the arena in which to debut the new Murcielagoo LP640 Roadster. Since its inception in 1907, the Los Angeles Auto Show has grown from 99 cars inside a skating rink into a major international event showcasing 1,000 of the newest vehicles from manufacturers. A record 35 vehicles will make their World or North American debut, the most ever in the 100-year history of the show. And of that number, 21 are World debuts, with seven being concept cars. When the show opens to the public from December 1-10 at the Los Angeles Convention Center, it will be the first major show of the North American season. The show is being held one month earlier than in previous years to avoid perennially conflicting with the Detroit auto show. The Murciélago LP640 Roadster follows hard on the heels of the LP640 Coupé, which made its debut in Geneva (above) earlier this year, a car that pushed the Murciélago theme forward and which has galvanised sales the dramatic V12-engined supercar. 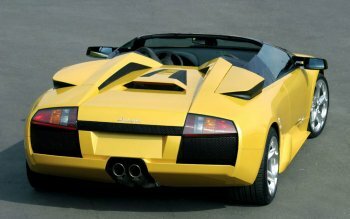 The new Lamborghini Murciélago LP640 Roadster is set to replace the current Murciélago Roadster (above), a car made distinctive from the coupé version by its revised engine cover as well as its open roof. The Lamborghini Murciélago LP640 Roadster will receive its world première at the Los Angeles Auto Show tomorrow, less than a week ahead of its European debut, scheduled for the Bologna Motor Show next week. This enables automakers to stage more debuts and to increase their participation, thereby elevating the importance of the LA show within the automobile industry, particularly to journalists, and provide consumers with a better overall experience. “This will be the best LA Auto Show ever,” states Andy Fuzesi, general manager of the LA Auto Show. “This is a new beginning with our new dates and increased commitment from manufacturers and everyone is anticipating even better things in the future. Cutting-edge design has been a growing emphasis at the LA Auto Show and with 15 manufacturer design studios, the LA region is a world design center. This year a record seven concept vehicles will make their World debut at the show. Four of them—Acura, Honda, Hyundai and Mazda—were designed by their LA-based advanced design studios. In addition to these four, exciting concepts from Ford, Volkswagen and a second one from Honda, are all expected to be forward-thinking expressions of new design directions for their brands. The show presents a broad variety of production makes and models from 47 manufacturers. Visitors can view everything from subcompacts to full-size cars, pickups to crossovers and sports cars to minivans. There’s something to suit every need, dream and budget. Two- and four-door passenger cars come in such a diversity of designs, features and technological advances, that narrowing the choice to just one is difficult. The Lexus 460L is so advanced that it parallel parks itself while the Chrysler Sebring has a multimedia hard drive capable of storing music, movies and photos. Volvo also is tossing usual tradition aside and comes to Los Angeles with its nimble new C30 three-door hatchback. Sporty, edgy and powerful are the mantra of many automakers. And this being LA, there is no shortage of sports cars making their debut, like the new Audi R8 premium performance coupe and the stylish and sophisticated V8 Vantage roadster from Aston Martin. For the truly exotic, there are the powerful Ferrari 599, lightweight Lotus Exige S and a new model from Lamborghini. Individuals searching for vehicles with more space will discover the range of SUVs, pickups and crossovers to their liking. BMW unveils its redesigned luxurious X5, Buick enters the luxury crossover category with the all-new Enclave and Ford introduces its completely redesigned Escape. From across the pond, Land Rover rolls out its rugged LR2 SUV that strikes a balance between luxury and off-road capability.